Religion :: Ed'son de Pary E.A. Cameroonians have a variety of religious beliefs, and many individuals combine beliefs and practices of world religions with those of their own culture groups. Approximately 53 percent of the population are members of Christian denominations, about 25 percent practice mainly "traditional" religions, and approximately 22 percent are Muslim. Most Christians live in the southern areas, and most Muslims in the north. Christian missions constituted an informal second layer of colonialism. Traditional religions are systems of practices and beliefs that adapt to changing social conditions. Most involve the veneration of ancestors and the belief that people, animals, and natural objects are invested with spiritual power. In addition to Christian and Muslim clerics, religious practitioners include the ritual specialists of cultural groups. These specialists may be political leaders, spirit mediums, or healers. Their spiritual power may be inherited, learned, or acquired through their own affliction and healing. Generally, they combine their religious activities with other forms of livelihood. 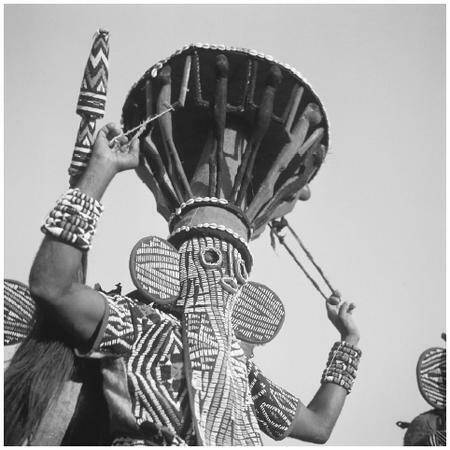 A Bamiléké tribesman wearing a mask during a traditional ritual in Cameroon. offerings to ancestors or spirits. Offerings include special foods, palm oil, libations of palm wine, and chickens. Among the monarchies of the Grassfields, sacred places include sites of former palaces where rituals that promote fertility and good fortune for the chiefdom are performed. 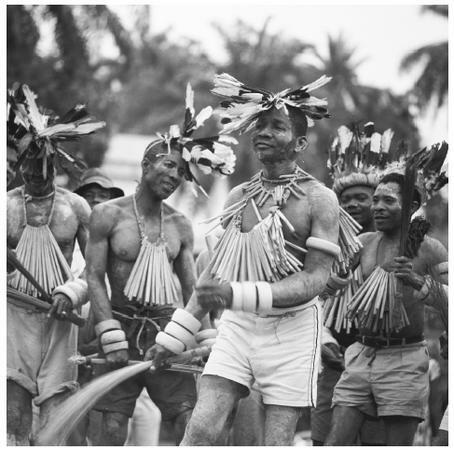 Cameroonian dancers from the Mabeas tribe. Dance is an essential part of many celebrations such as weddings and coronations. groups. Ancestors may be remembered in oral literature (the Fulani), buried in elaborate tombs in the family courtyard (Catholic Ewondo), or reburied and provided offerings of prayer, food, and shelter (the Bamiléké). The Fulani, like other Muslims, believe in an afterlife of material rewards for those who obey Allah's laws.